One of the first applications that I write for a new platform to learn the ropes is an RSS reader. That rule holds true for Windows Phone 7. The great thing about the Windows Phone 7 SDK and the .NET 4.0 platform is that everything you need to work with RSS or any other syndication feed is ready for you right out of the box! With Android development, you need to parse the XML and return values yourself. For just reading an RSS feed, it’s a nightmare. The references don’t, however, show up in Visual Studio 2010 automatically, so you’ll need to add them manually. I’ll go over it all in this guide to programming RSS feeds in Windows Phone 7. XNA applications are great for games or fancy-pants apps, but not for RSS readers. For our blog/RSS app, we’ll need to just select the standard Silverlight list template. This gives us a great head start with the UI that we can use as the main menu of post titles (and more that we’ll use in later posts). Now for the magic! If you’ve read my other post on how to read RSS feeds in Android, you’ll be relieved to know that Windows Phone 7 is leaps and bounds easier than Android! Microsoft was kind enough to give us System.ServiceModel.Syndication, which contains absolutely everything you need for dealing with RSS feeds and xml-based syndication. However you must add System.ServiceModel.Syndication.dll manually as Visual Studio 2010 does not show it in the list of references out of the box. 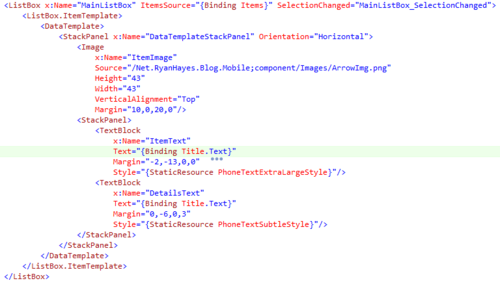 Right-click References in the under the Windows Phone 7 project in the Solution Explorer. In the list, select System.ServiceModel.Syndication.dll and click OK.
Sets the RSS feed URL of the feed you want to display. Creates a new HttpWebRequest with that url to fetch. Starts an asynchronous request to grab the feed. The first few lines of the method make sure the HttpWebRequest came back with an OK status and gets the response information. If everything checks out, then we proceed to parsing the RSS feed that was returned. First, we use XmlReader to get the response as an XML document. Once we have that, we load the reader into a new Syndication Feed. The SyndicationFeed is basically a wrapper around a standard XML object that already has all the properties ready to grab that you would expect in an RSS feed and its posts! ** _**Awesome!_ From here you can the SyndicationFeed however you want. For my blog application, I chose to set the SyndicationFeed object as the ItemsSource for the MainListBox in my UI. And that’s it! Seriously, that’s all you need to get started with reading RSS feeds in Windows 7. In part II of this series I’ll finish up the project and show you how to maneuver to a second page and show the full post in the blog app.